31st July 2014 – Some at times adverse weather conditions over the past few days has not stopped a vociferous crowd at Hampden Park roaring on the performances of the athletes and they have had plenty of PACE athletes to support. Chris Tomlinson (ENG) finished in fifth place in a very competitive mens Long Jump final. Chris produced a consistent series but was unable to land the one big jump that would have catapulted him into the medals. His best leap of 7.99m came in round 2. 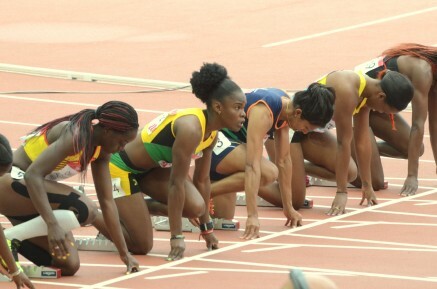 Schillonie Calvert (JAM) progressed to her second individual final of the championships by winning her 200m semi-final in 22.97. Less than 2 hours later she was back on the track for the final and recorded a marginally faster time of 22.94 to take 6th place. After breaking the Games record in her heat Hellen Obiri (KEN) had started among the favourites for the womens 1500m but unfortunately it was not to be on this occasion as she finished 6th. Jemma Simpson (ENG) was 9th. However, there was disappointment for Andrew Osagie as he was disqualified after his 800m heat and also for defending Commonwealth champion Andy Turner (ENG) who did not finish his 110m hurdles heat after hitting the first hurdle. As we move into the final two days of the athletics programme the relays begin tomorrow which will see many PACE athletes in action and also Phillips Idowu begin his triple jump campaign.